« American Clay Enterprises, Inc. Develops Training Program, Increases Business Opportunities for Union Locals with the Help of O.P & C.M.I.A. Irvine, CA (June, 2010) – Mediterranean cuisine specialist Denise Hazime has made quite a name for herself on the internet and has even been touted as the reigning “Queen of Hummus” by The Wall Street Journal. But to the millions who are familiar with her online persona, and have made her Hummus video the #1 Mediterranean cooking video on YouTube, she goes by Dede of Dede’s Mediterranean Kitchen, commonly known as DedeMed. Since 2007, Denise has run DedeMed.com, an interactive website where visitors can learn how to make their favorite Mediterranean dishes, created over 65 video recipes to date, opened the very first Mediterranean food stand on Marine base Camp Pendleton, and is set to debut her own spice line this year. Before opening a food stand or starting a spice line, Denise already had a large, loyal following of foodies, cooks, the health-conscious, and people who wanted to get in touch with their cultural roots, devoted to her tried-and-true authentic recipes and her quick-and-easy cooking tips that give this tradition-based cuisine a modern twist. Her Hummus video on DedeMed’s YouTube channel (www.youtube.com/dedemed) is the #1 Mediterranean cooking video (with close to 400,000 views to date) on the internet and 3rd only to two Food Network cooking show videos in the general cooking video category. DedeMed’s YouTube channel features more than 65 videos so far of Denise preparing a large variety of traditional Mediterranean dishes – everything from Hummus, to Falafel, to Baklava and Couscous. “I would have never imagined that by starting DedeMed–inspired by my husband, friends, and Time magazine’s Dec. 2006 cover on YOUTube–that I would have touched so many lives through a cooking website. Out of love for my mother and passion for eating, I learned how to prepare Mediterranean and Middle Eastern food, so that I could help her cook for so many family members. From that joy and passion, I realized I could share this with the rest of the world”, says Denise. The proof is in the rose water pudding – Denise’s cooking videos are an internet sensation, and testimonials from her fans keep flooding in: “You have helped me make things I never could have done without you.” (Leila M.). “It’s so hard to learn some…recipes because my family never measures. Your videos are easy to follow and have really been a great help.” (Diana). “It was so refreshing to see your recipes on Youtube. I never made my own hummus until I saw your video. 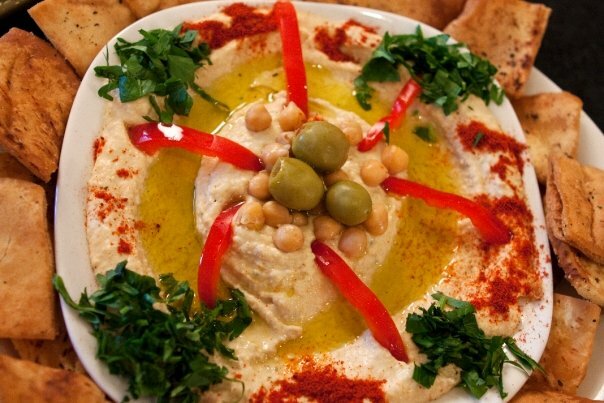 I can’t believe …[it] is the best hummus that I have ever had!” (Ankstar). “You are so efficient in your videos and it feels like family when you cook.” (Solange B.). “It’s super fun and easy to pay to attention. You got a great attitude and attention to detail is awesome” (Moe K.). “I am obsessed with your site!” (Lina Z.). The popularity of her cooking videos and the advice of her husband Crisantos (a Marine veteran) ensured that a Mediterranean food stand—called DedeMed’s Shawarma House–would be very popular among returning Marines at Camp Pendleton. “Whenever we go to war with a country, we bring back the food,” he told the reporter in an interview with the Wall Street Journal. This proved to be true, as hoards of returning Marines became returning customers as well. Even before experts gave it the credit it deserves and placed it at the top of the pyramid (so to speak) as one of the healthiest diets in the world, Denise had long known of the benefits of following a Mediterranean diet. Olive oil, garlic, spices the likes of cumin and cardamom and now the chickpea have all been touted for their health-bestowing benefits and disease-fighting characteristics. DedeMed.com has had a far-reaching impact on those interested in learning more about Mediterranean cooking around the world. With DedeMed.com, Denise has turned her love of cooking and knowledge of Mediterranean food into more than just a hobby. She shares her art of cooking Mediterranean cuisine with all those who want to learn to cook, eat healthy, and live better. Media inquiries, please contact Rosette Pambakian (rosette@dubroworks.com) or Julie Du Brow (julie@dubroworks.com) at 310-821-2463. DedeMed (www.dedemed.com) offers a comprehensive list of interactive video recipes of Mediterranean cuisine as well as an online store for purchasing useful cooking utensils and the DedeMed spice line. DedeMed’s Hummus video consistently holds the rank of #1 most viewed Hummus video, and is the most viewed Mediterranean cooking video to date. This entry was posted on June 24, 2010 at 8:37 pm and is filed under Food, Health. You can follow any responses to this entry through the RSS 2.0 feed. You can leave a response, or trackback from your own site. This not only sounds wonderful but looks incrediable! Can NOT wait to try it. I’m bookmarking this recipe! Thanks!